Steamed Fish and Bok Choy with Garlic and Ginger (adapted from a recipe that came in a Nash’s Farm share box in 2008): First, make that sauce: in a small bowl, combine 3 pressed cloves of garlic, 1 Tb. grated fresh ginger (I like my Microplane grater for ginger), 3 Tb. lemon juice, 1 Tb. soy sauce, and 1 Tb. olive oil. Whisk and set aside. 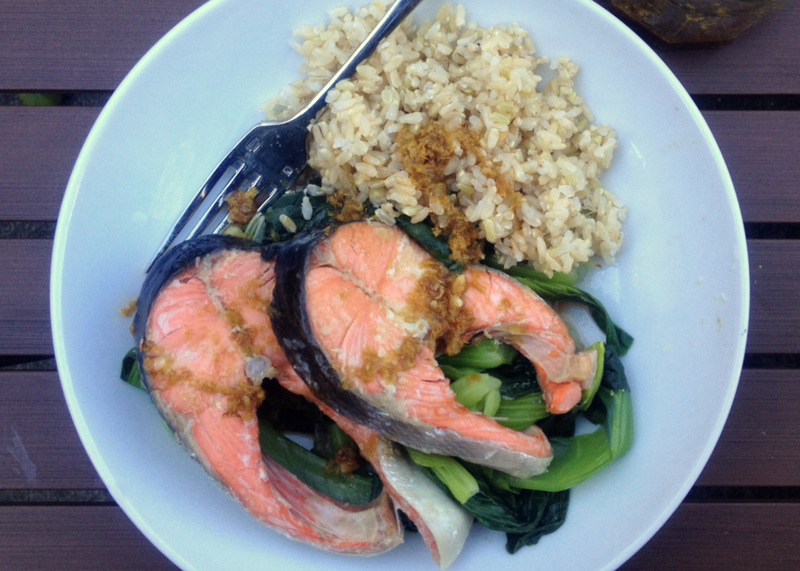 Serve fish and greens alongside brown rice, drizzled generously with the dressing. Garnish with chopped green onions if desired. This entry was posted in Asian Flavors, Fish, Food, Recipes, Sauces and tagged fish recipes, ginger-garlic sauce, halibut, Nash's CSA recipes, salmon, summer recipes on August 9, 2012 by emmycooks. sounds like exactly what I need to eat for dinner! A very health dish. Perfect the the bok choy. Great looking salmon steaks. We eat salmon about once a week. Bok Choi is a lovely partner for it. Must try it with the brown rice it looks excellent.